Here’s the after to Tuesday’s before, with my row of Bestå shelves from Ikea fully assembled. 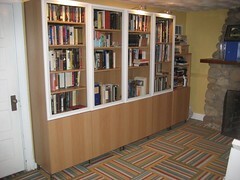 The doors went on Monday night, and the books went in the last few nights. I’m still waiting on one glass door and a few DVD organizers for the small shelf to the right, which will help with the clutter there. The hardest thing about the shelves is probably just deciding where to put them to maximize storage. The shelves that meet the bottom of the glass doors need to stay fixed, and there are LPs behind the bottom doors, so that dictates the position of two shelves; and there needs to be another fixed shelf about a third of the way down for stability. But there are a lot of options for the other shelves. I ended up doing something I swore off years ago: sorting books by size and spacing the shelves accordingly. I bought five extra shelves for the units I bought (comprising four 75-inch bays and one 50 inch bay), and I think I still need to buy one or two more extras. Bonus: click through on the photo and look at the “original size” version on Flickr, and you can get a pretty good look at the titles in my library.